Our deer and animal repellents give your plants and flowers the ultimate protection and provide an easy application. This animal repellent covers 500 square feet and is made from natural and recycled ingredients. It contains no petro-chemicals, is environmentally friendly, and will not harm wildlife. It's also easy to use - simply spray on your plants and flowers and you'll deter deer, rabbits, groundhogs, and other animals from destroying them. This animal repellent covers 3000 square feet and is made from natural and recycled ingredients. It contains no petro-chemicals, is environmentally friendly, and will not harm wildlife. It's also easy to use - simply spray on your plants and flowers and you'll deter deer, rabbits, groundhogs, and other animals from destroying them. Have you ever had your plants or landscape destroyed by pesky deer? Fortunately, there is a safe and reliable solution: PAWS 1 FOR ALL Animal Repellent from Benner’s Gardens! During spring and summer, deer are a huge problem for people who spend a lot of time and money on their yards. Deer have become over populated because they have no natural predators and an excess of food available. Hunting has also reduced, supporting deer infestation even further. On average, there are 15 to 20 deer per square mile of where the areas they habituate, with some areas having up to 100 per square mile. They may be a joy for the average person to admire, but people who are passionate about their lawns and landscaping are finding themselves looking for better solutions on how to prevent deer damage. A fantastic way of protecting your yard is deer repellent because it targets the very sensitive taste and smell senses of deer and safely and effectively deters them and other animals away from your plants. Deer repellent, like PAWS 1 FOR ALL Animal Repellent from Benner's Gardens is in no way harmful to animals. 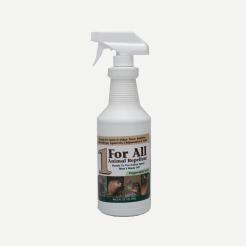 Benner's Gardens Pet and Wildlife Solutions PAWS 1 FOR ALL Animal Repellent is made from natural ingredients. It is environmentally friendly, but still achieves results. Our natural deer repellent has ingredients that deer have an aversion for such as certain plant species, hot pepper, garlic, eggs and fish emulsion. These ingredients have been proven to trigger a deer's sense of smell and will keep them away from your property without harming them. The first step in deciding if a deer repellent will work for you is to take the time to understand how severe your deer problem is. Repellents often work best when applied before deer develop a feeding routine. It is best to apply repellent before plants bud or grow. However, the unique formula of Benner's PAWS 1 FOR ALL Animal Repellent also works wonders on all plants and foliage in all stages of growth. Simply spray the deer repellent onto the desired area and allow it to dry for at least two hours before watering or rain. PAWS 1 FOR ALL Animal Repellent from Benner's Gardens is a humane and environmentally friendly product that can help you avoid deer from getting accustomed to feeding on your valuable foliage. Deer repellent can be very useful for protecting your lawn, but in order to fully safeguard your landscape, it is important to take every precaution necessary. That is why Benner's Gardens offers top quality deer fencing that will keep your lawn safe from deer damage. We can help you design a protection solution for your yard that will be effective. Our selection of deer fencing can be custom ordered to accommodate your exact needs. The fencing is designed to stand tall enough to keep deer from jumping over it and can be reinforced with additional posts to provide you with strength that will guard your plants from more aggressive deer. It is a more humane solution than electric fencing and won't be a visual obstruction like metal fencing can be. In fact, our deer fencing is virtually undetectable from 20 feet away. It will preserve your yard from deer damage and won't hinder its aesthetic appearance.